Oh SWOON! Funnily enough I have been thinking of making a sign with this phrase on. This is one of my all time fav movies from my childhood.LOVE. Fun stuff! I almost spit my coffee right out reading that first one!! LOL ... love your hey girls!! Hey girl, you've got the answer, or answers, to your old aching back issue. Hehe. Junkylicious! Hey Girl and Princess Bride. You win. Thanks for joining the party! You do win....anyone who uses Westly must be a kindred sprit! LMAO........ yes laughed out loud, and thankfully Brawn is not around me to ask why. LOL!!! Your Hey Girls are too funny!! Love them! Saw you sharing at the Valentine Hey Girl party. Hah! Love both of them. Thanks for linking up! That's fantastic! That's one of the most quoted movies in our house! LOL. So funny. Love it! So Funny!!! You are quite the clever one! I saw your cute "hey girls" over the the HG par-tay. 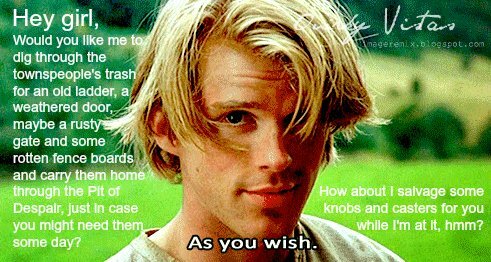 I must remember to add the "As You Wish" to my everyday repertoire...it sounds so accommodating. LOL! I saw him recently on that show 'The Chew'. One of the female hosts was hyperventilating when Cary Elwes came out to surprise her. She asked him to say it and he did...'as you wish'. He was too cute. bwa-ha ha ha ! I LOVE IT!!! Farm-boy fetch me that broken down dresser on the curb. Cute! I wanted to do this too - haven't got a photo shoot done of my hubby though! YESSS! Hilarious! :) Thanks so much for the laugh today! Oh, yes, I WISH! Love me some Westley. Super Crazy, Liz. One personality bright and beautifully verbose and one darkly succinct. Love them both. He can cast my casters too! AH! one of my all time favorite movies, so these are AWESOME! How funny! Love your 'hey girls'. What a great challenge. Haha. Where can I find a volunteer like this? You had me at "Hey" ~ LUV IT!!! These are hilarious!.. who wouldn't want Cary Elwes as Wesley to be the Hey Girl spokesman.. something about a man in a mask! How much fun is this! Thanks for the lift! HAAAA!!!!!!!! I seriously snorted just now. Casters. Love. And that movie.......sigh! That is too cute!! I love your "hey girl"!! 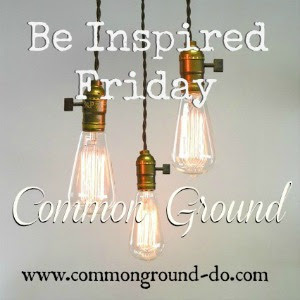 I just found your blog and it is just lovely!! Oh yeah, you can't go wrong with some princess Bride :-) Love it! Hey Girl...your hey girls are some of the best! This party is so much fun! I have seen a few of the Hey Girl posts and I have to say your first one is my favorite. I like the second also, but of all those I have seen, - you win!